Triangle grid breakdown – Youpi ! this is a reply to @upupzealot asking for more details about this pen. there is no random so to speak, the PRNG (Pseudo Random Number Generator) creates a seed-based (& therefore reproductible) series of seemingly random numbers. then I set up a canvas / context, nothing special. in the update() function, the first thing I do is to reset the PRNG value: PRNG.setSeed(3); to make sure I’ll get the same random sequence each time. it’s done in 2 steps, first create count points (lattices) around the center at a random angle a and a random radius r.
then create spawn points around this lattice also at a random angle but with a much smaller radius offset. // NB (i%2==0?-1:1) flips the direction of every other particle. // and "odd" lattices rotate counter clockwise. then we have some context reset and we call yolo a given amount of times so it renders at different scales. 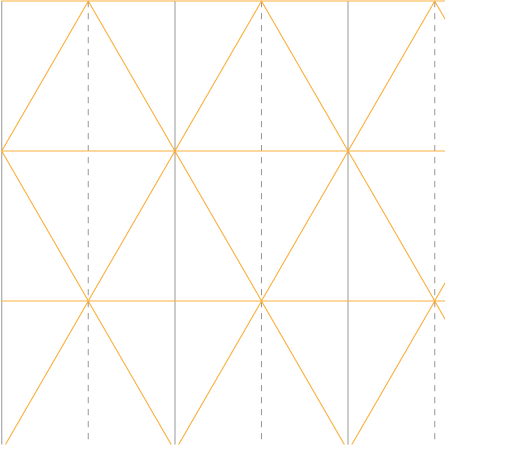 to compute the equilateral triangles grid, we need to compute some variables, especially an equilateral triangle side length and height. 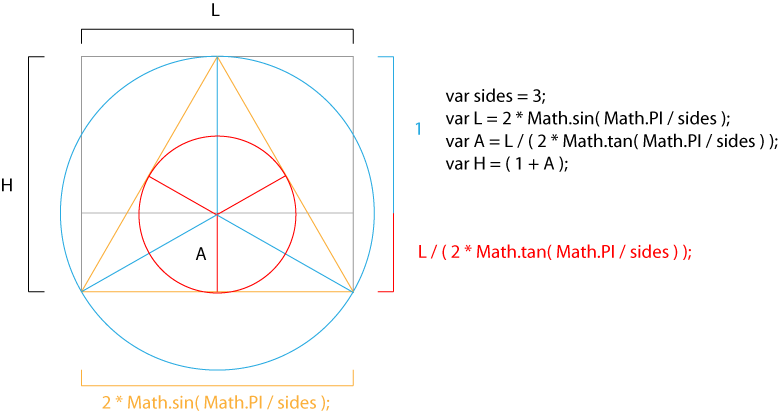 note that this also work for N-sided regular polygons, in this case we have 3 sides. having a rectangular grid helps a lot when it comes to finding which is the closest lattice. 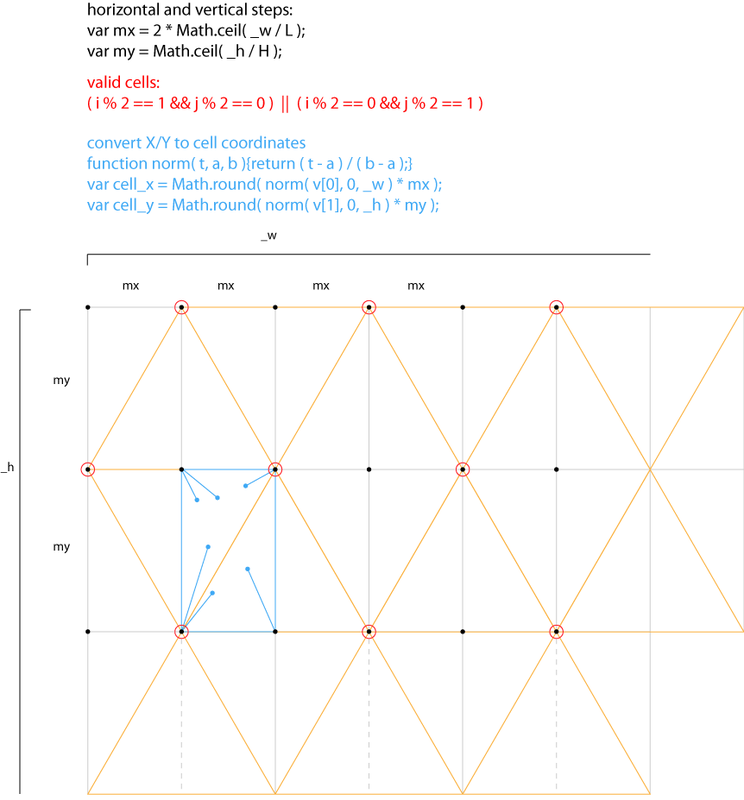 for instance cell_x & cell_y can tell us which is the closest lattice without the usual minimum distance computation. once we found which celle the vertex belongs to, we can iterate only on the neighbour cells to find the closests valid lattices. that’s why the loop ranges from cell_x-2 to cell_x+2 & cell_y-2 to cell_y+2. this saves a lot of computations. 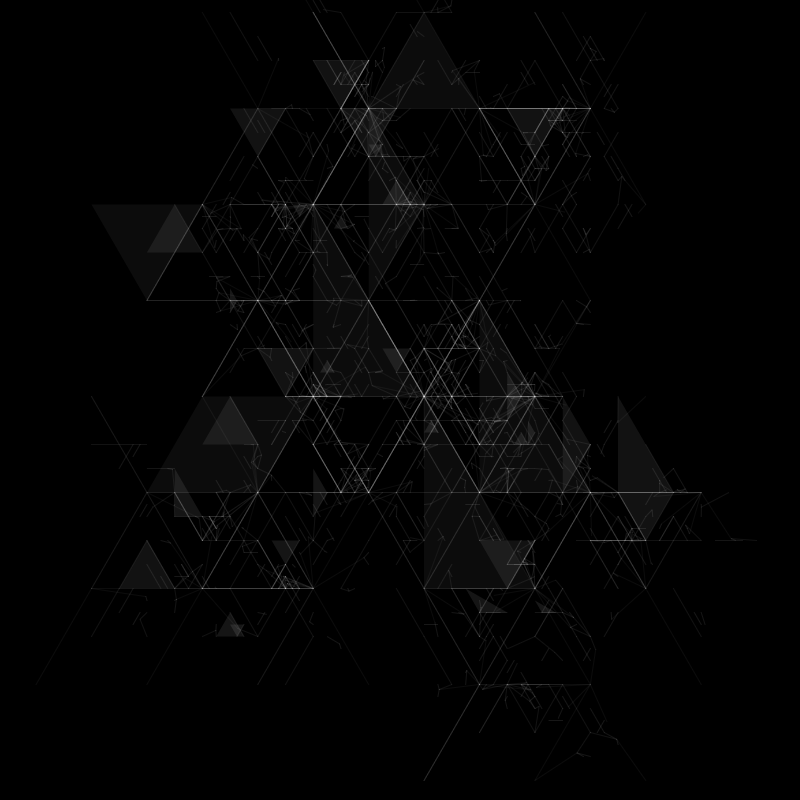 // we can check the lattice-vertex distance and store it in a temporary array (ps). //now we have what we need to render the vertex. the important thing to remember is that there is no random but Pseudo random and time. Since it’s always the same sequence of random numbers, the ‘random’ chances of drawing, an edge or a triangle are always the same ; it doesn’t flicker like it would if we had used a regular Random function. I’m back on Paris since October, do you have some time for a beer ? Copyright © 2019 Youpi !.